One afternoon, Carolyn Smithrud was at a winery when she overheard a group of friends visiting McMinnville discussing who would drive them home that evening from the wine tasting. Smithrud struck up a conversation with the gentlemen who opted to stay sober and drive for the evening and a brilliant idea started to form. “I thought, well, I have a car and I have time,” says Smithrud, who was in-between jobs at the time. Wheels N Time was born shortly after Smithrud talked to the Chamber, close friends and past colleagues who encouraged and supported her idea to open a personal private transportation service in McMinnville. After Smithrud’s past positions as the VP of Administration at Evergreen, Field Coordinator for the Ford Family Foundation and a member of Toastmasters International, she felt lost in the workforce and longed for something more. 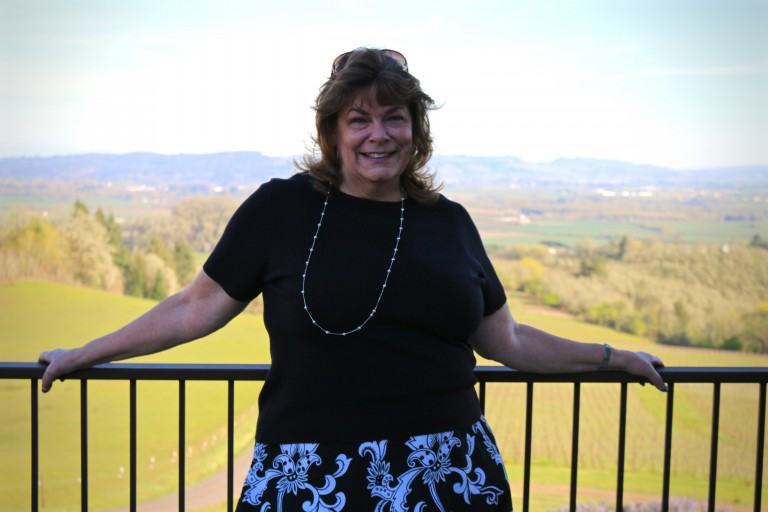 Her passion for customer service and love for the Willamette Valley led her to open Wheels N Time, where she not only is a driver, but also a tour guide. “I ask customers what their interests are, what they want to see and then make suggestions. I enjoy sharing my knowledge of the area with others,” explains Smithrud. Not only does she take groups on wine tours but will also drive individuals to dinners on McMinnville’s famous 3rd street, to Lincoln City for the day or to the Portland airport. “It’s your day, so we do it your way,” she says. Smithrud stresses the importance of being involved in the community as a small business owner. “It is important to network and meet people. Being connected is never a bad thing,” she says. Smithrud also says she wants people to know that she isn’t like a traditional taxi or Uber service; she is more personal and enjoys getting to know her customers. “I love what I do because it allows me to see the beauty of this area through others’ eyes. You never realize how lucky you are to live where you do until someone else shows you,” she explains. Smithrud wants to see the McMinnville community build stronger bonds with surrounding towns like Yamhill, Carlton, Lafayette, and Dayton. “The McMinnville community is already so strong. We can only grow stronger with the support of the communities around us,” she says. She says it is important to keep connected because you never know what doors or opportunities it will open for your business.